Since February marks American Heart Month, there’s no better time than the present to think about small changes that could possibly make a big difference in our health. There seems to be a “Top 10” list for everything these days, likely because it’s a great way to group items in a manageable way. (David Letterman may be partially responsible, too.) I’ve seen enough “Top 10 Heart Healthy Foods” lists over the years to know that berries, nuts, and beans are highly recommended. And thanks to its abundant supply of heart-healthy omega-3 fatty acids, salmon, especially wild salmon, often claims the top spot on these lists. I frequently hear from readers who would like to incorporate more fish into their diets but aren’t sure how to do it. For those who haven’t cooked fish, it often seems daunting. But with the right recipe, fish can actually be a quick and easy weeknight meal that’s equal parts healthy and delicious. The following dish requires just three ingredients besides the salmon, and you can count my 82-year-old dad as a fan. He first enjoyed this simple meal one night last year. My mom was out of town, so I invited him over for dinner. He raved (like a good dad does), and I mentioned that this was something he could easily prepare himself. Several weeks later, he called and asked me for the recipe. That very night, he cooked it for my mom–and she raved, too. With its short list of ingredients and quick prep time, this meal is a regular on my weeknight rotation. The flavor and simple elegance of the finished dish makes it company-worthy, too. For those who prefer it, wild salmon is increasingly available throughout the offseason. For best quality, look for salmon that has been flash frozen in vacuum-sealed packaging. Wild fillets tend to be thinner than their farmed counterparts and thaw in a matter of hours (submerge the sealed package in cool water to expedite), making them a convenient freezer staple. So quick and easy with a flavor that suggests you worked hard. I love the little chunks of cooked garlic, so I opt for extra and chop it in pieces slightly bigger than the standard mince. In a small bowl, mix together the maple syrup, tamari (or soy sauce), garlic, and optional ginger. I sometimes add a few grinds of the pepper mill, too. 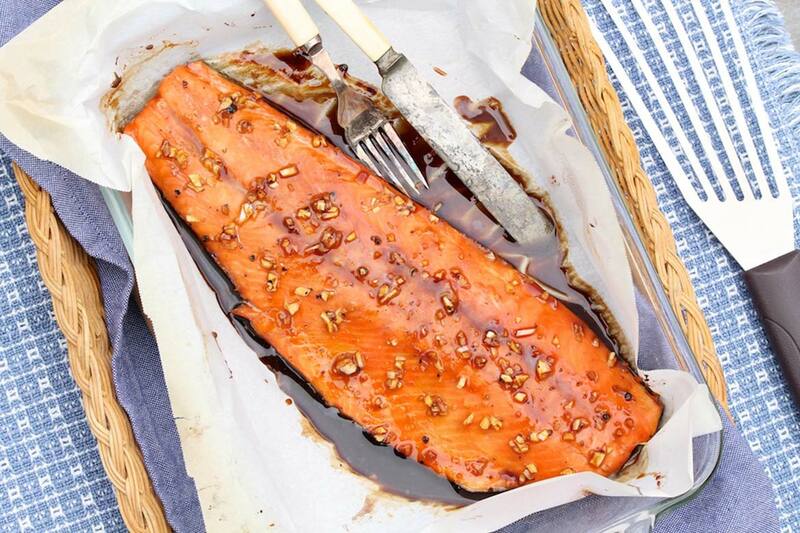 Place the salmon in a shallow glass or ceramic baking dish that is just large enough to hold the salmon. (This will keep more of the maple syrup mixture around the fish; line with parchment or foil for easy cleanup.) Pour the mixture overtop. Marinate the salmon at room temperature for 30 minutes, using a spoon to drizzle the tamari mixture over the top once or twice. Meanwhile, preheat the oven to 400 degrees F. Place the salmon in the preheated oven (with the marinade) and bake, uncovered, for 15 – 20 minutes, or until just barely cooked through the center. Most tamari is gluten-free and it tastes just like soy sauce. Double-check the label if this is important, as there are exceptions. Likewise, soy sauce typically contains gluten, but there are options that do not. Helpful hints: Check the salmon a little early, cutting into the fillet if necessary, as cooking time will vary based on the variety of salmon used and the thickness of the fillet. I like to remove the fish from the oven when there is the tiniest amount of uncooked fish in the center of the fillet. The fish will continue to cook for a minute or two after it is removed from the oven, and this will ensure an end result that is tender and not at all dry. Thinner fillets of wild salmon may cook in as little as 8-10 minutes. Conversely, if the salmon cut is particularly thick it may require extra time in the oven. In this case, cover the baking dish with foil for the first 10-15 minutes. This will ensure that all of the marinade does not cook off. Any extra liquid is delicious drizzled over the cooked salmon or a side of rice or steamed broccoli. When in doubt as to how long to cook the salmon, use a quick-read thermometer and look for an internal temperature of 120 degrees F.
Thanks to the quick prep and great flavor, this healthy meal appears regularly on the dinner table in our house! This looks good Ann. Will be trying it next week. Since I have a lot of wild salmon in my freezer and typically make salmon twice a week, I am always looking for salmon recipes. Thank you for another recipe to try. Thanks, Gail. Salmon is popular with everyone in my family so we eat it a lot, too–and I love the convenience of frozen wild fillets. Hope you enjoy this recipe as much as we do! I tried it and it was delicious! A new favorite for me. Having company over and making this dish-it’s always a hit and sooo easy! So glad it’s a keeper and worthy of company, Judy! 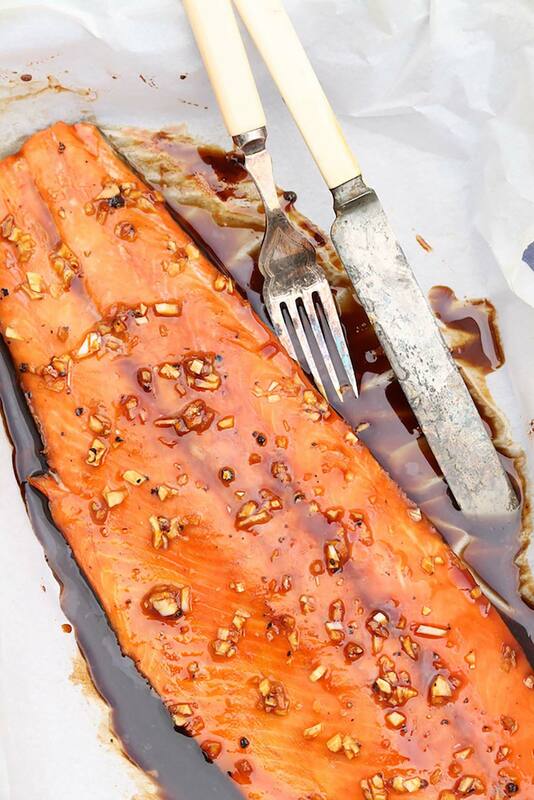 How would you adjust this recipe to cook the salmon on an outdoor propane grill? My kids would rather I cook fish outside. Thanks! Hi Dennis, I would cook it in a loose foil packet to preserve the marinade, which flavors the salmon nicely. You’ll have to adjust the cooking time based on grill temp and thickness of the fillet, but an internal temp of 120 degree F is what you’re aiming for. Hope that helps!